At left is a photo of me wearing the beginnings of this costume. 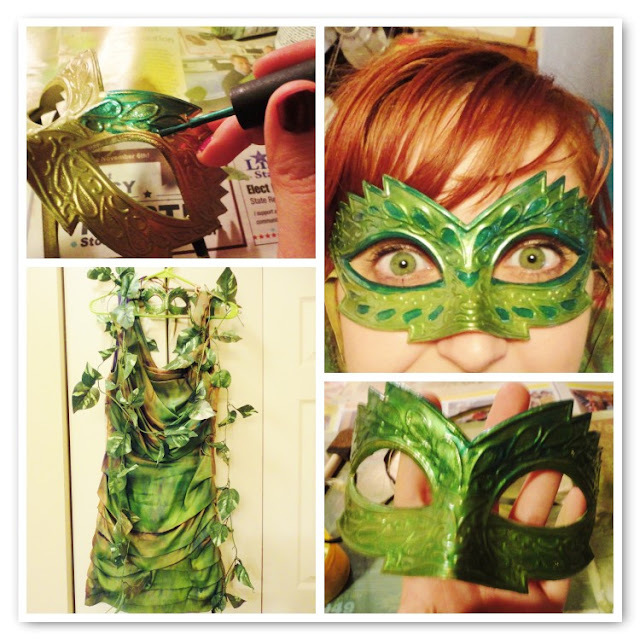 For my 22nd birthday in February 2011, my gal pals and I got dressed up in cute dresses and masquerade masks for a tiny party followed by a night out on the town. Definitely one of my favorite nights ever. 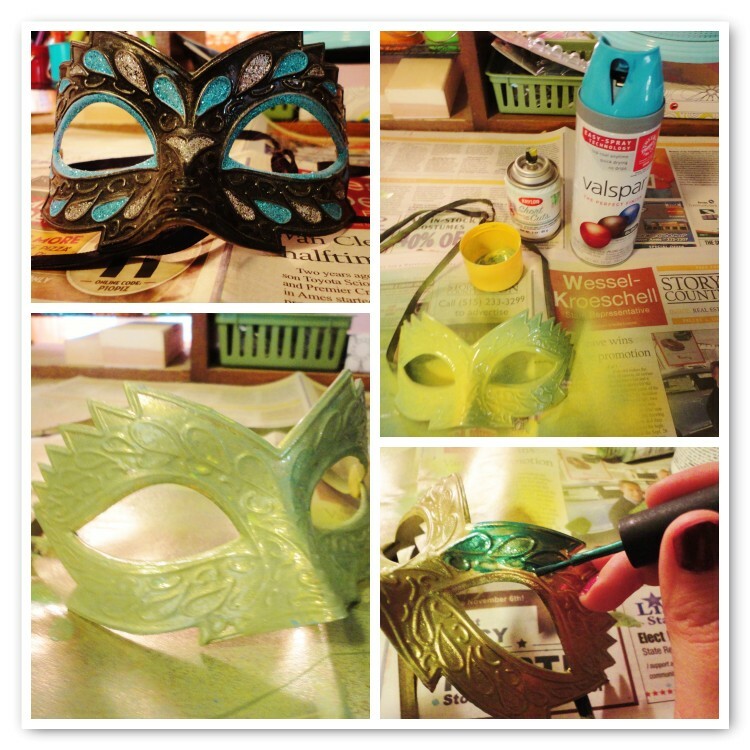 My mask was turquoise (of course!) with black details. It went perfectly with this figure-hugging dress I snatched up on clearance at Express for less than $20. (Score!) So anyway. This mask had been sitting on my vanity since that night... except for another night out on the town where we decided to resurrect the masquerade theme just for the heck of it. And except for another night or two, this dress has just been hanging in the closet. To be honest, I wasn't sure if it still fit me. Well, I tried the dress on. And surprise! It still fits just fine! So I got this hare-brained idea that I could re-vamp and re-wear both the mask and the dress... just in time for Halloween. So what do I reach for? Well, obviously my weapon of choice: Spray paint! I knew that the spray paint would work great on the mask. The dress, however, I was a bit leery about. But I turned it inside out and tested spray paint on the interior, which is made of the same silky satiny material as the outside. First I did the mask. I didn't have green spray paint on hand. And to keep up with my challenge, I really didn't want to run out and buy any. So I sprayed it with yellow and turquoise spray paint at the same time. (Blue + yellow = green, right?) It gave me a good greenish base. Next I sprayed a fine, misty layer of copper spray paint over it. Then I went to work with two shades of nail polish: an emerald and a peridot. I was so excited to try it on and see how it makes my green eyes pop! As for the dress... now that was an interesting experience. You see, after a week of severe storms followed by several unexpected days of 80-degree temps... the Indian Summer has finally abandoned us and real autumn (chilly winds, dreary rain, and all!) has settled upon Iowa. And so spray painted outside while shivering and teeth-chattering is just miserable. I spray painted my dress inside. :S Bad idea, I know. Even with the fan on and windows open... I ended up with a horrendous headache, nauseous tummy, spray paint taste in my mouth, and sticky inside-of-nose. Very bad signs, I know. Anyway, I stuck it through. I'll admit, the dress looked worse before it looked better. I had to give it a good coat of copper to cover the dark indigo-colored spots. 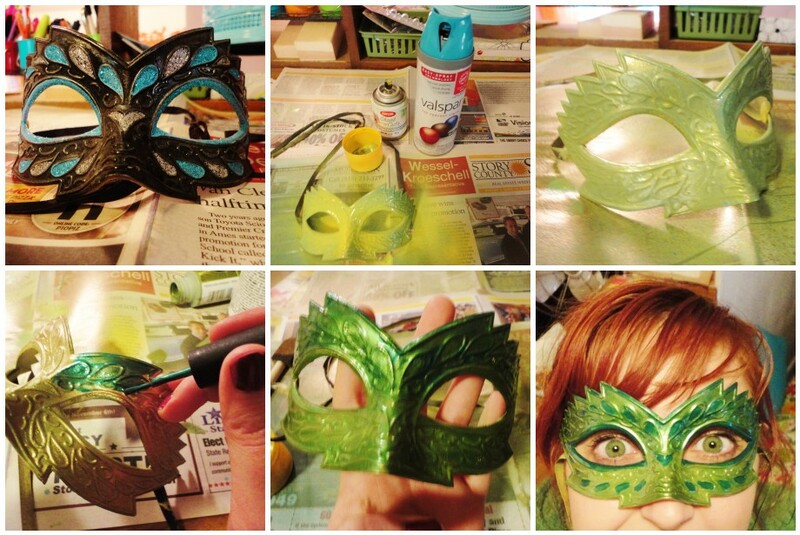 And then some emerald green spray paint (yes, I had to hit up HobLobs). And then some yellow spray paint to brighten the green. And then some more copper, some more green, some more yellow, some more green. Eventually it started looking like what I wanted it to. (...Or maybe I was just hallucinating? Haha. Jk.) Next time I'm definitely wearing a mask though... the kind that covers your nose and mouth to prevent breathing fumes. Lastly, I gave the leaf vines a quick coat of green and copper spray paint to brighten them up. So there it is! My costume! I'll post a picture when it all comes together. I wouldn't believe you could spray paint a dress!